Butler’s Jacie Dalton brings the ball up court during the Aviators win ocsd Greenville. Ella Neely takes a shot during the Aviators win ocsd Greenville. 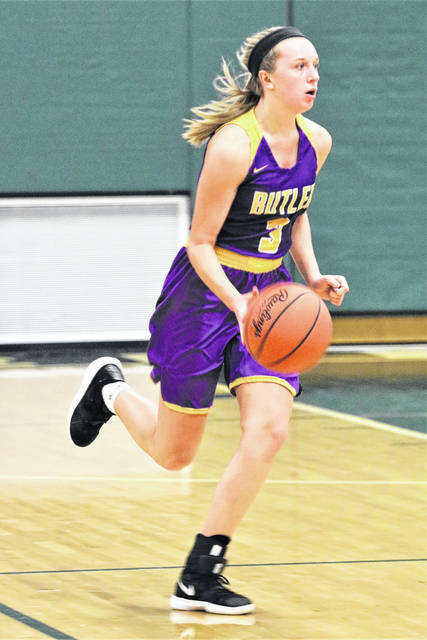 GREENVILLE — After two days of sub-zero wind chills, the Butler Lady Aviators felt the chill on their offensive output in the first half at Greenville Thursday night. Playing a day later than originally scheduled, and coming off two days of no school due to the frigid temperatures, Butler was cold offensively for the first 14 minutes of the contest. However, after falling behind 16-9 with just over two minutes to play in the first half, the Aviators closed on a 9-0 run en route to a 38-31 Greater Western Ohio Conference North division victory. The win lifted the Aviators to 8-4 in conference play and 10-8 overall. Greenville fell to 8-9 overall and 5-7 in league play. Despite getting good looks, the Aviators struggled to get shots to fall. Evan Neely got the Aviators on the board early, but the two teams exchanged the lead three times before the Wave took a 9-7 lead at the end of the first period. Butler’s offensive struggles continued early in the second period, and after back to back three pointers by Greenville’s Jada Garland, the Aviators found themselves in a hole 16-9. A basket by Tyree Fletcher with 1:50 to play in the half, though, sparked a 9-0 run to close the half. Megan Allen scored 5 straight points and Jacie Dalton scored on a layup to give the Aviators an 18-6 advantage at the half. Butler picked up where it left off in the third quarter. 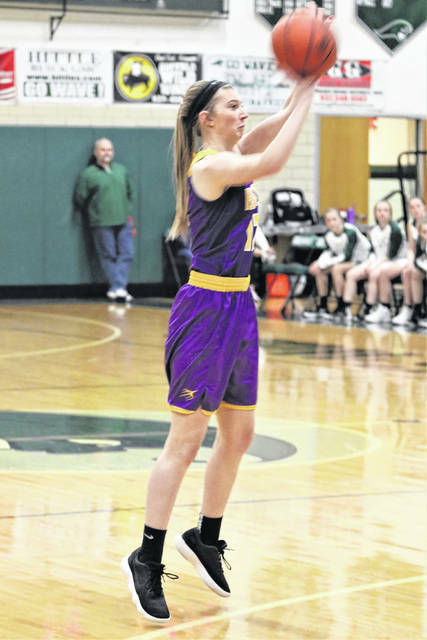 Fletcher found herself open in the middle of the Wave zone defense and hit a pair of jumpers and Evan Neely scored on a rebound and put back basket that put the Aviators in command at 26-16 after the 17-0 run dating back to the second period. The Wave crept within 6 a couple more times but each time the Aviators had an answer. Garland led all scorers with 12 points on 4 three-pointers. Fletcher led the Aviators with 11 points and 9 rebounds. Gracie Price scored 8, Evan Neely had 7 while pulling down 11 rebounds, Jacie Dalton 6 and Megan Allen 5. Abbie Schoenherr didn’t score by had 6 rebounds and five assists.